The DOW gave back about 120 points going into the close after breaking 9,000 earlier. For the day, the DOW was up 298 points, the S&P gained 3.84%, the NDX was up 4%, and the RUT wound up making up ground to lead again while gaining 4.4%. Fundamentals? Another day, another bailout, another CEO grabbing huge bonuses… nothing new. Maybe we bail the automakers out one of these days? Whatever, it won’t change the final destination for them or for the markets. From my point of view the more money we throw around now, the faster we reach bottom! But don’t try to tell them that, it’s like talking to a drug addict, they can’t hear you! They will continue to shoot up until they are laying on the floor wondering what happened – THEN maybe sanity will return. Cynical or just being realistic? Technicals? Today was interesting. We gapped higher but added just about another 100 points on to the DOW or 10 onto the SPX from there. Thus, if you bought the open and sold the close, there wasn’t that much to be had, the majority came in the overnight hours. We now have a couple of open gaps beneath us. I don’t think there’s any doubt we’ll be back down there to fill them later. In the mean time we have a ‘B’ wave rally underway so we might as well all head to the malls in our Suburbans and max out our credit! Kidding! Volume on the day was slightly higher than Friday’s advance on the DIA, but slightly less on the SPY. The daily fast stochastic is moving into overbought and the slow is getting there. Fresh buy signal on the weekly, the fast is pointed up out of oversold. The VIX closed down only 2.4% but is still beneath it’s 50dma. This move down was not commensurate with the move up in equities – a small divergence there. The XLF had another strong showing today and is closing in on my short term target of $14.50 which is the symmetrical a-b-c target and is coincident with the 50dma and top of the daily Bollinger band. The Bond market was interesting, rates moved up a little, but again, not a commensurate amount with the size of the rally. 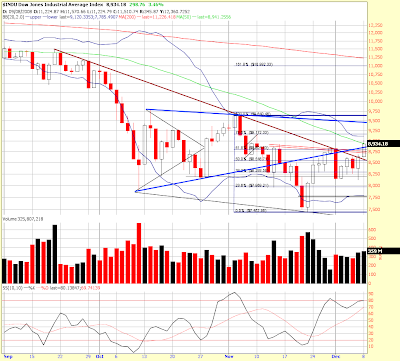 The TNX produced a different looking hammer, possibly a reversal signal? Look at SRS, it was nearly $300 less than two weeks ago, and is now down to $78! Terrible buy and hold vehicle as IYR is not up nearly enough to justify that move at 2X inverse. FAS, the 3x bullish financial ETF, was the winner on the day, up nearly 18%! That’s a serious hot potato, no buy and hold there! Market internals were overall positive and I note that the number of new highs is finally coming off the zero and one readings we’ve had lately. Today we had 11 new 52 week highs on the NYSE – still pathetic, but stronger than it has been. I note that the DOW failed to close above it’s 50dma after being above it earlier. Bottom line is I think we may have some correcting to do in the morning on the down side, but I’m thinking symmetrical rally until Thursday unless we just run out of steam before then. Chart of the SPX 30 minute below. 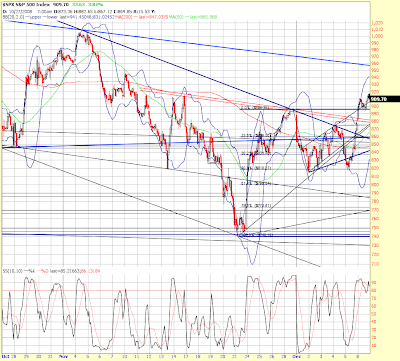 Note the close above the neckline and how the old flag channel top is now providing support. Stochastic is overbought, but notice on the ‘a’ wave on about the 25th it came down but did not make it to oversold and prices continued up. If symmetry holds, we may see something similar.